Captain Nottage dressed for a day's sailing. 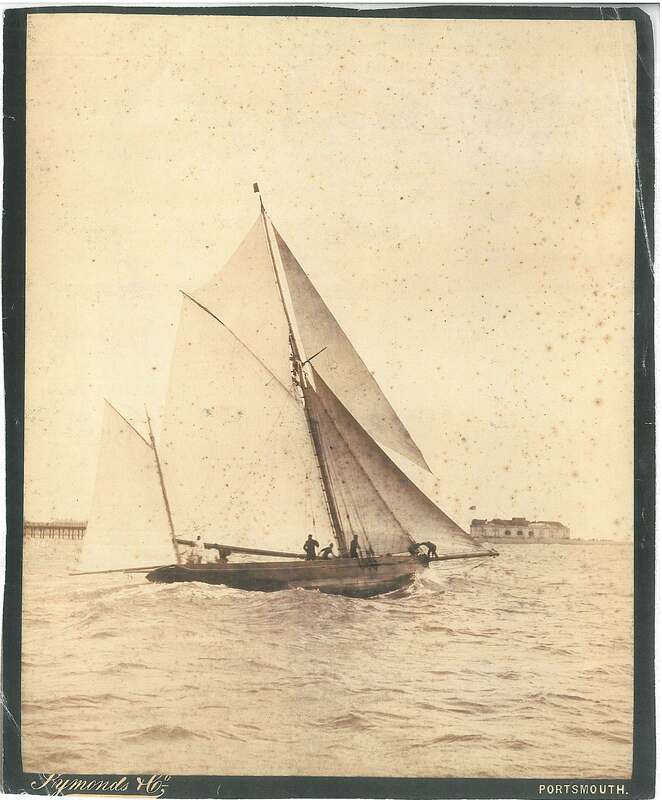 Charles Notttage's forst yacht off Portsmouth. 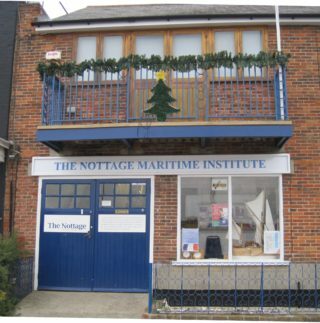 The Nottage Institute's home until 1947. The Nottage on the Quay in the 1950s. A Nottage party in the main room. 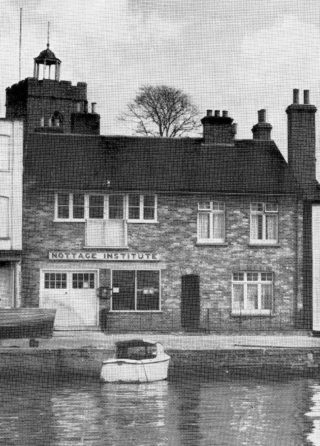 The ‘Nottage’ is quite conspicuous on the Wivenhoe Quay waterfront between the British Legion and the Rose & Crown pub, although it is surprising how many residents have never been in it. Those that enter for the first time are often taken aback by the wealth of historical artefacts on display. 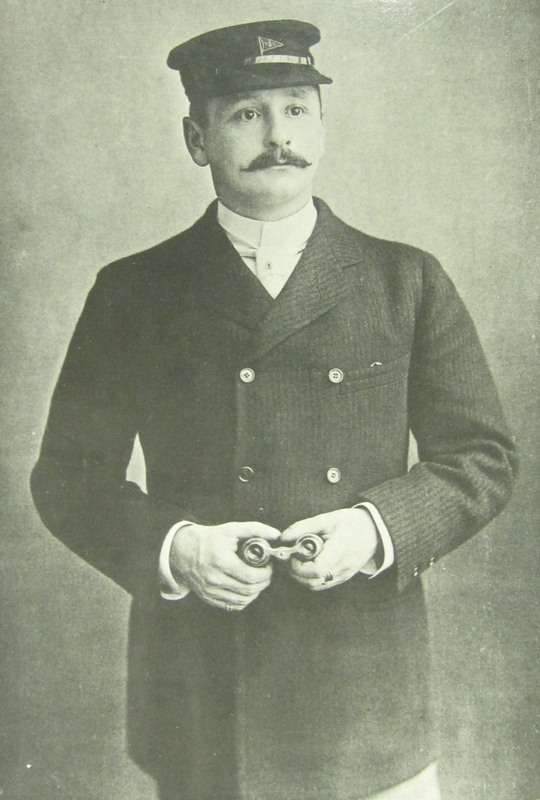 Born in 1852, Captain Charles George Nottage was a Victorian gentleman with a wide range of interests; and a passion for yachting. The son of George Swan Nottage (who had the misfortune to be the first Lord Mayor of London to die in office for over a century), Captain Nottage was an officer in the Devonshire Militia Artillery, not a sea captain. The family originally came from the village of Nottage in Glamorganshire, but had settled in Essex, adopting the name of their place of origin as their family name. The family business was a pioneer in the new art and science of photography, the London Photographic & Stereoscopic Company, and was the source of the family’s wealth. Charles was interested in photography, he took photographs to illustrate his book, and held open exhibitions and competitions for photographers; which naturally helped the business. He studied at Cambridge University with the object of taking up a career in law, but he never did. Instead, apart from photography and, no doubt, the usual pursuits of wealthy young men, he began yachting in a serious way. In an age when many yacht owners left the running of the vessels to a professional master and crew, Charles Nottage worked to gain a master’s ticket for himself, so that he could be his own skipper. He had his own yachts, the Foxhound and the Deerhound, and won a number of trophies with them. He bought the first, the 35 ton Foxhound in 1884, and ordered the Deerhound in 1888. The Deerhound was completed in 1889, but sadly he soon had to give up his great passion when, in 1890, he became too ill to continue racing himself, although his yacht won a few more trophies without him at the helm. He wrote a book entitled ‘In Search of a Climate’, which was about his round the world journey to try to find a place to live where he could feel comfortable with his lung condition. 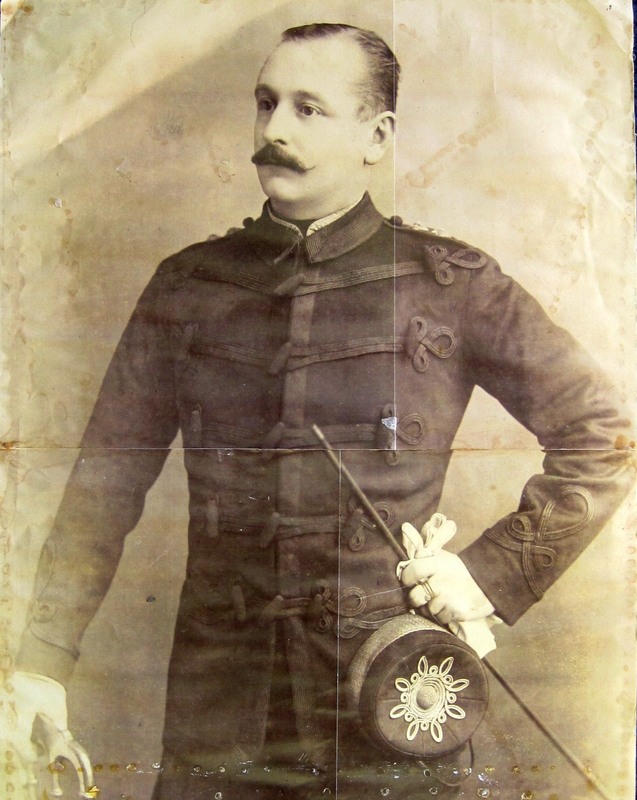 Charles Nottage died on Christmas Eve 1894. He was preparing for another voyage, and had just received an inoculation against a tropical infection, when he suddenly became very ill and he died. In his will he left money to found an institute for the teaching of nautical skills to yachtsmen. He had in mind the sort of men who had crewed his own boats, working professionals who often had had a minimal education, but who were excellent seafarers by virtue of their trade. 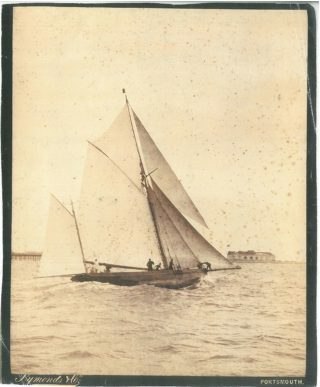 Many yacht crews came from the Colne and Blackwater villages, where shoal waters and a need to get a hold full of oysters fresh to Billingsgate, bred a group of men with the ability to sail a small boat at full speed in tricky seas. The Committee appointed in his will decided that Wivenhoe was the ideal spot with its railway station as well as access to the river. 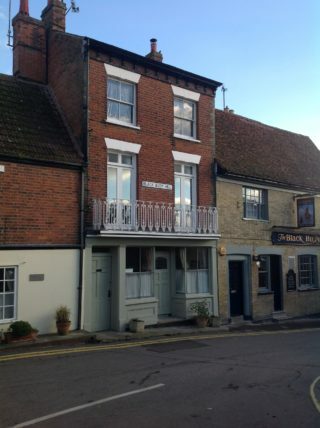 The first home for the Nottage was the Lucy Dee, next to the Black Buoy pub, but in 1947 it was in a position to purchase the sail maker’s loft of Hector Barr who was retiring, and this is where it is still to be found. Over the years the need for the Nottage has changed. Nearly all yachts are now crewed by amateurs, working mariners are better educated, and yachts have technical aids (sat-nav., radios and motors) that people in the 1890s could not ever have imagined. Although day skipper and yacht master courses are still taught, radio, and engine maintenance are also taught. Since its beginning, many people have given things to the Nottage, we have the pierhead paintings of yachts, steam and sail, that were bought by proud masters and crew in Naples, probably for the equivalent of a few shillings. We also have half models that were the three dimensional working drawings used in the local shipyards, and navigational instruments donated by retiring master mariners for teaching celestial navigation, which the sat- nav. has now made a dead art. All these things can be found among the exhibits adorning the walls and display cabinets of the Nottage upstairs. Downstairs one can see the course-work of the students of the Boatbuilding class, boats at various stages of construction usually tend by happy coincidence to give an overview of the whole process. There is a library too, this was specified in Charles Nottage’s will, with the condition that no books of a religious nature should be found in it. In fact, Captain Nottage was so appalled by what he saw of the activities of missionaries in the South Sea Islands, that it is also a condition that no sort of priest or clergyman of any denomination should hold a position on a future committee. 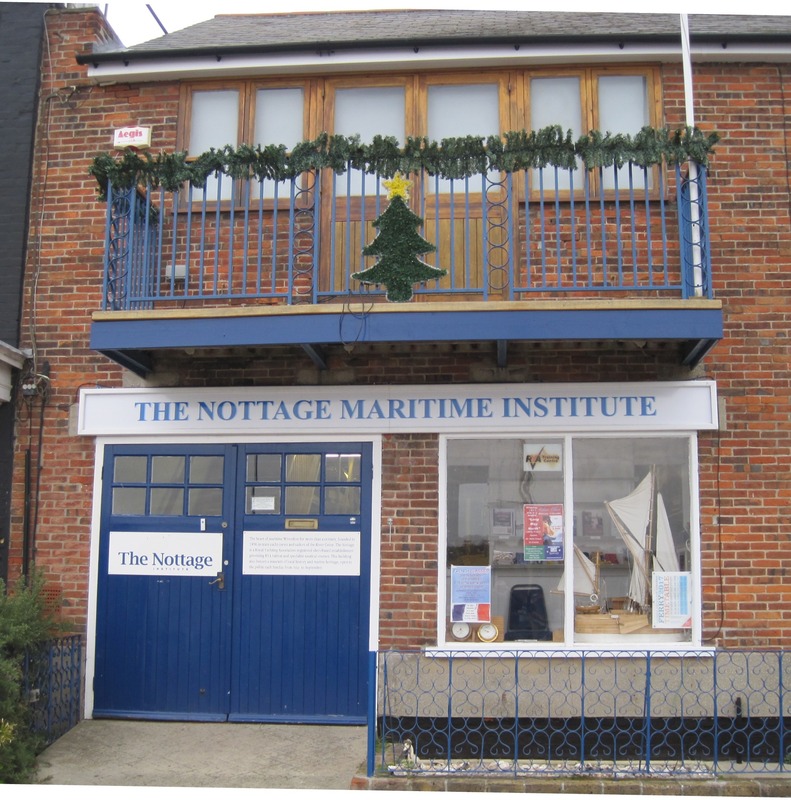 The library and the main upstairs room are still used for Nottage classes in various practical nautical subjects, and by other people to teach courses in many other things too, French, Literature, and Creative writing are popular perennials. 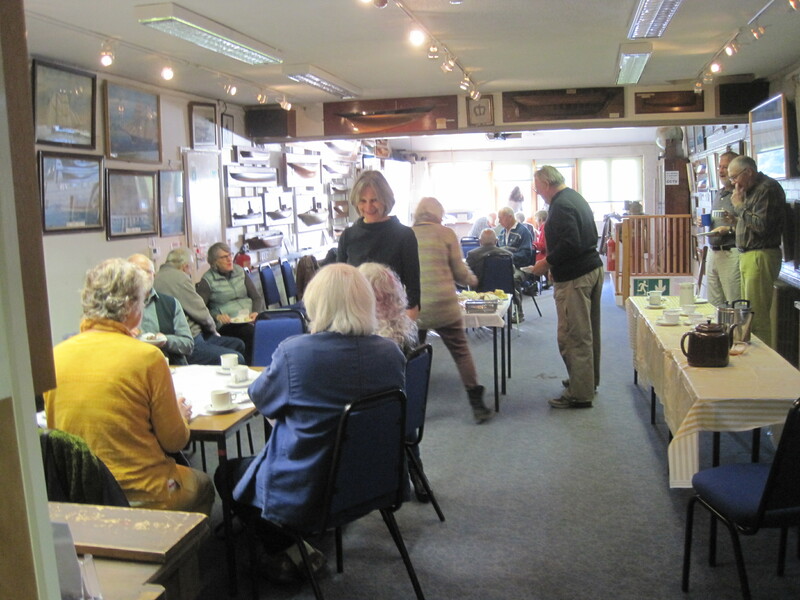 During the Summer, when there are no Nottage classes, the main upstairs room becomes an exhibition gallery for local artists and the Nottage’s own exhibition, traditionally historical with a local and nautical flavour. In fact either or both these rooms are available for hire for meetings, parties or dinners when not otherwise in use. This page was added on 06/04/2019.